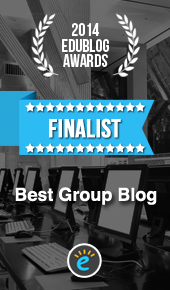 Speechie Freebies: Welcome to the Weekend Buzz! We have been working on this for quite some time, and even posted about it once or twice on our Facebook page, but it is finally here! 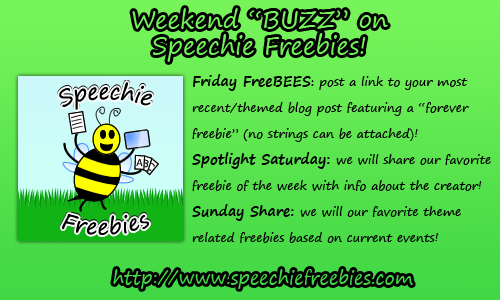 Welcome to Speechie Freebies' "Weekend Buzz"! Today, we are starting this weekly, weekend feature with our first "Friday FreeBEES" link-up! If you are a blogger who has a freebie to share, please make sure you read the rules prior to linking up! 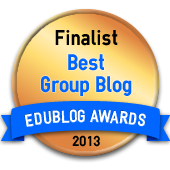 Otherwise, if you are a reader, stop by all day today to download free materials from your favorite speechie bloggers! 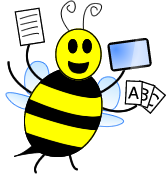 Come back Saturday (tomorrow) to see who which website we feature and to download a freebie of theirs! Finally, on Sunday, our authors will be featuring our favorite free downloads of the week with a literacy theme for March is Reading Month! We look forward to seeing you not only during the week, but on the weekends as well, here at Speechie Freebies!